Gymnema by Hiamalaya Herbal Healthcare really curved my cravings for sweets along with my appetite overall. Gymnema by Himalaya Herbal Healthcare does cut my appetite. no bad taste or smell. no obvious uncomfortable side effects. Three months ago my blood sugar was 11.4 and know it is at 6.9 great!! Thanks Gymnema by Himalaya Herbal Healthcare and PureFormulas!! 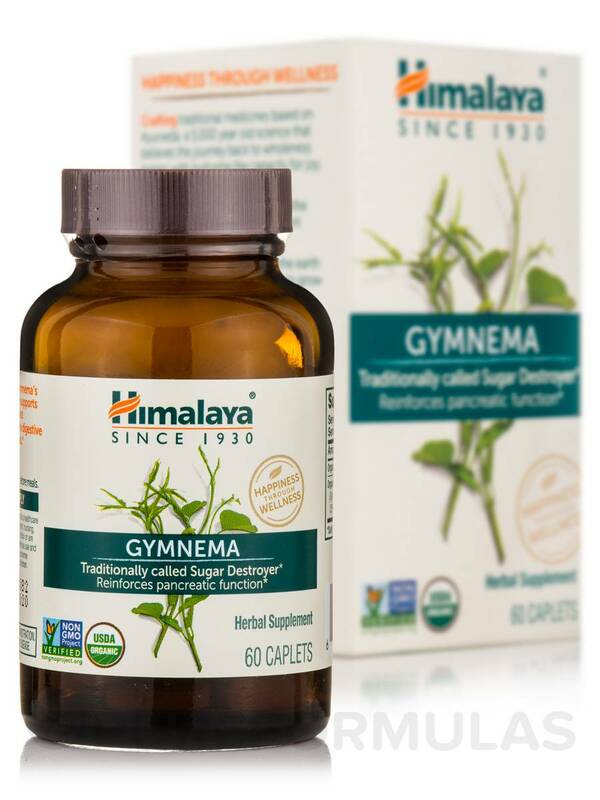 Lower elevated blood sugar levels and lose those extra pounds with Gymnema Caplets from Himalaya Herbal Healthcare®. This gluten-free organic product may also maintain suitable function of the pancreas and support healthy blood lipid levels. 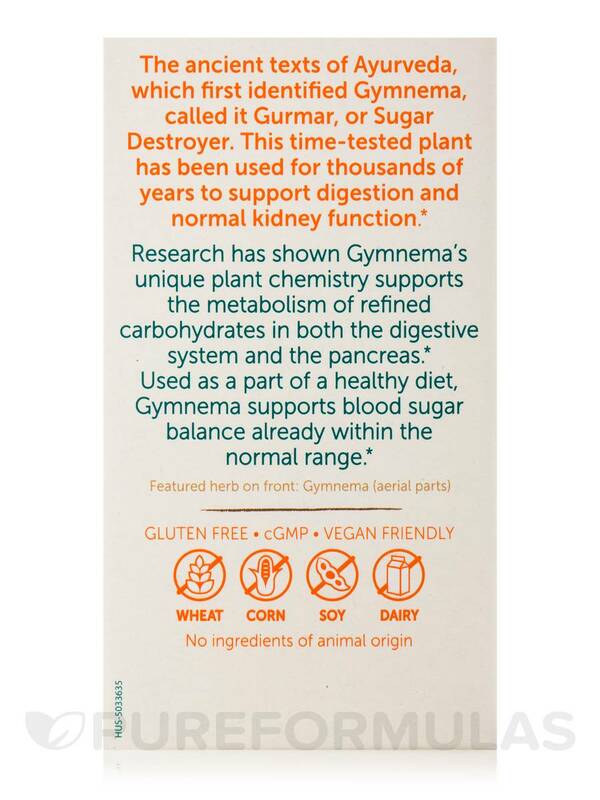 Gymnema reportedly reduces the amount of sugar absorbed from the intestines and controls blood glucose. This medicinal herb may also ease liver conditions‚ indigestion‚ and flatulence. 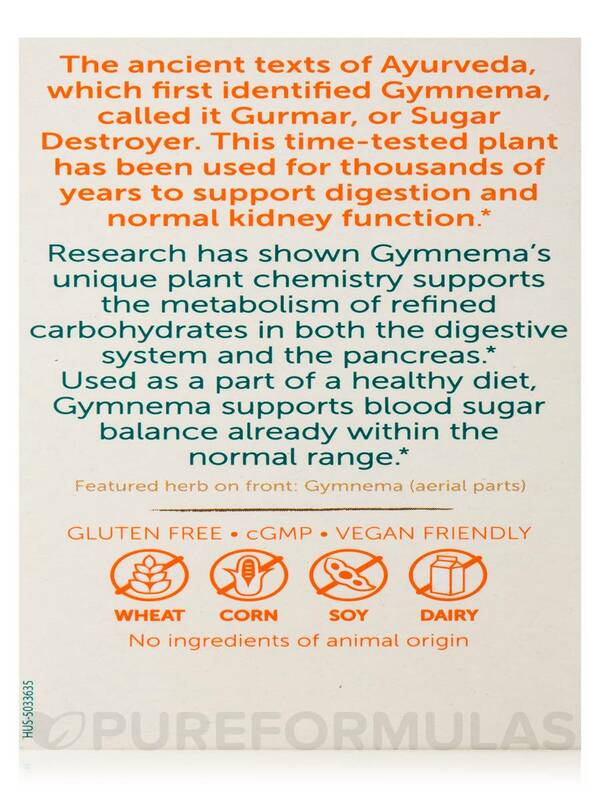 Gymnema could support healthy bowel movement and increase urine output. 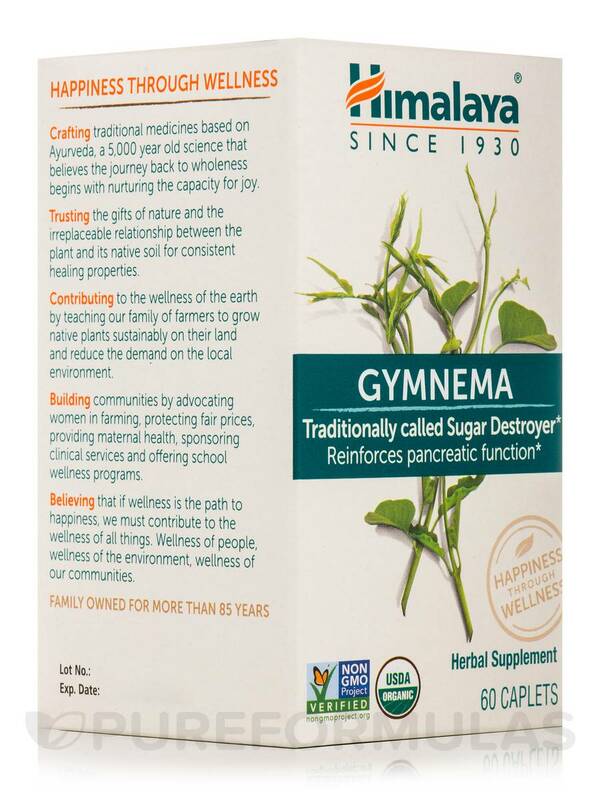 Gymnema regenerates pancreatic cells and stimulates the pancreases to release more insulin to regulate blood sugar levels. The presence of gymnemic acid in the roots and leaves of gymnema plant may desensitize your taste buds to reduce the taste of sugar in your mouth‚ thus preventing you from eating too many sweets. The sugar blocking property of gymnema in this herbal supplement from Himalaya Herbal Healthcare® could lessen the amount of glucose that gets accumulated as fat in your body and thus help you stay fit. 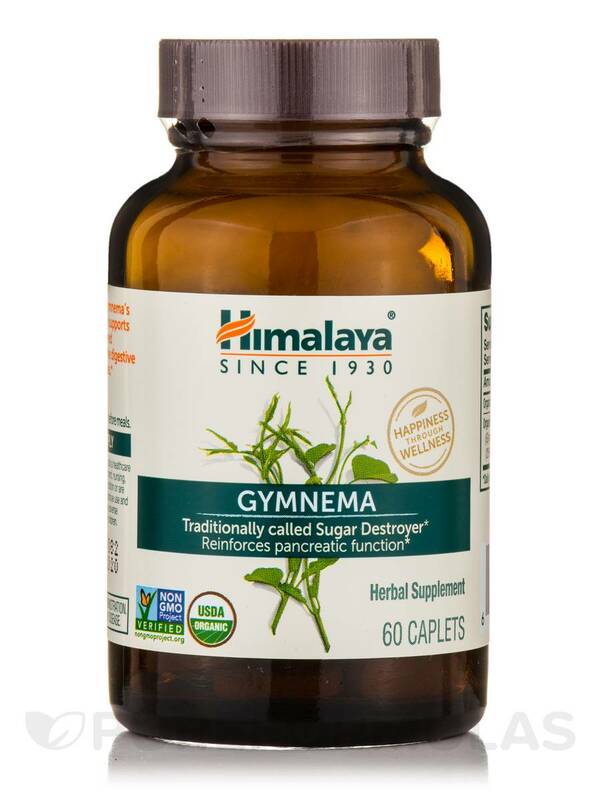 Make Gymnema Caplets from Himalaya Herbal Healthcare® a part of your diet and it may reduce frequent cravings for sweets and increase lean body mass. No wheat‚ corn‚ soy‚ dairy. 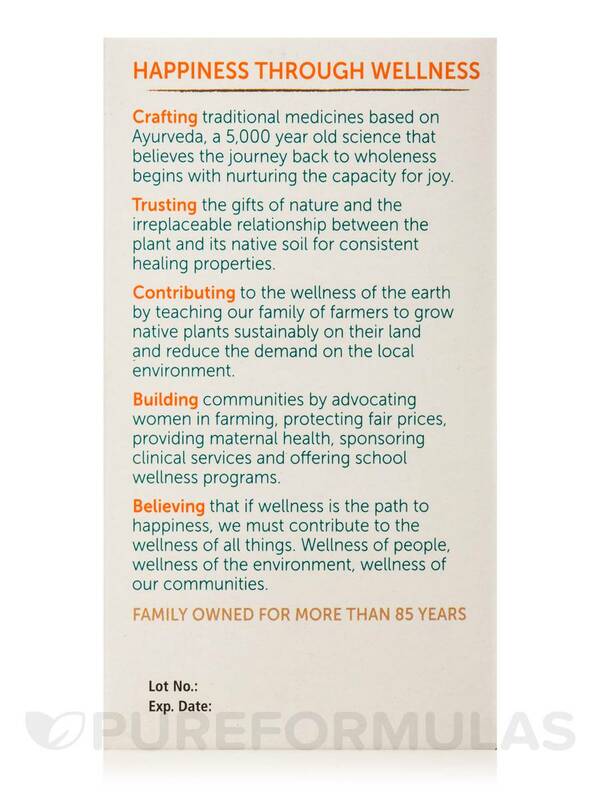 Non-GMO Project Verified / USDA Organic / Gluten-Free / cGMP / Vegan / Vegetarian / No ingredients of animal origin. Adults take 1 caplet twice daily before meals. 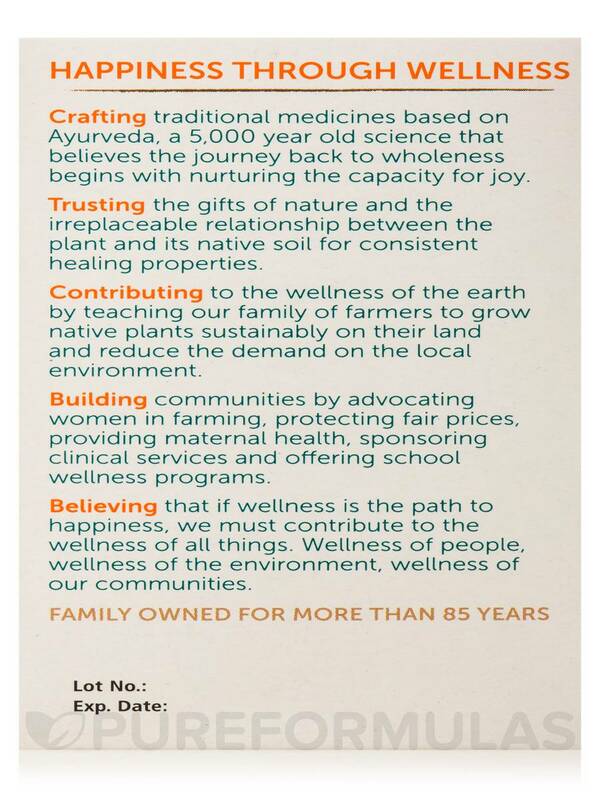 I don't think Gymnema by Himalaya Herbal Healthcare works. Its a small pill and it gives me energy. Great price. 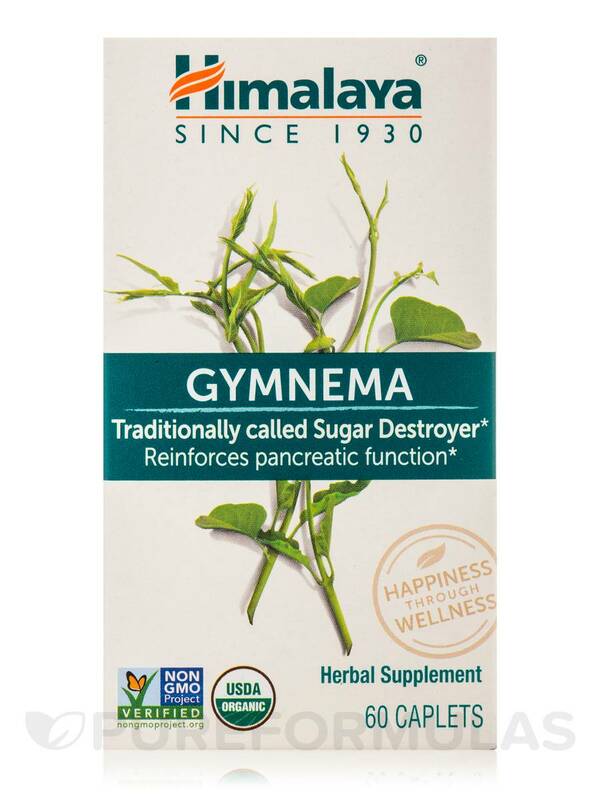 I have been taking Gymnema by Himalaya Herbal Healthcare for awhile and believe it is a helpful addition to my arsenal of natural products for my type 2 diabetes. I like that the caplet is easy to swallow and that it is organic. The price with PureFormulas is exceptional. 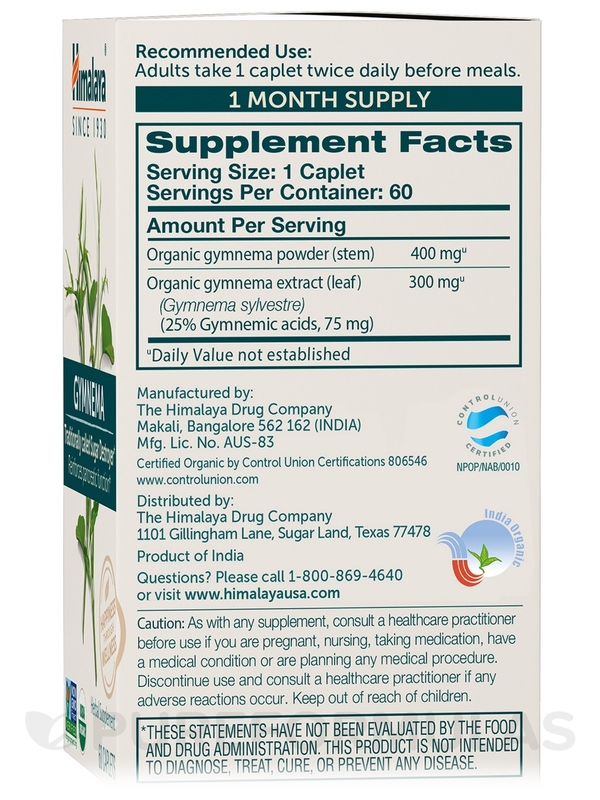 Gymnema by Himalaya Herbal Healthcare works great. For me this really cuts that desire for something sweet. Great price at Pureformulas.com! Gymnema has stopped by blood sugar from roller coasting throughout the day. I order several bottles at a time because I never want to run out. It works like it is suppose to. The ingredient list seems incomplete because the capsule must be made of something. Is it a stearate of any kind? Thank you for reaching out to us, Liz. 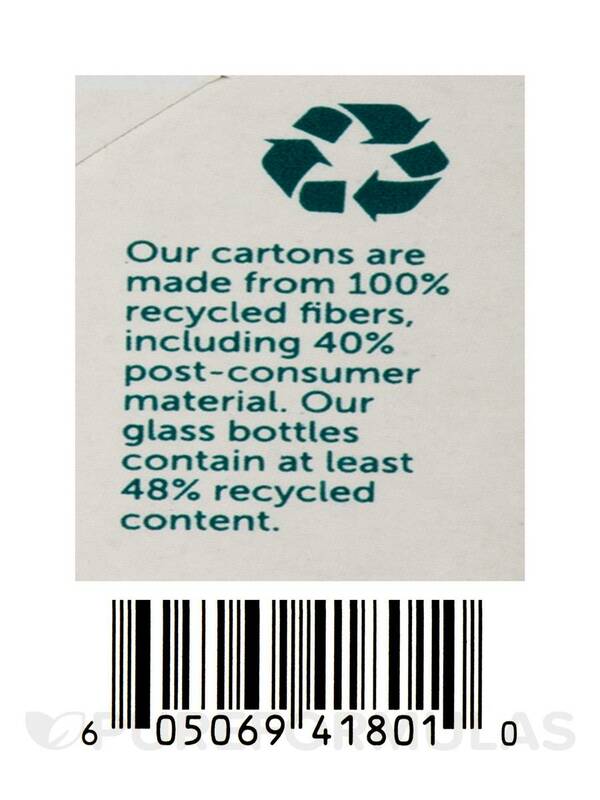 All ingredients are listed on the bottle. Becasue this product is in caplet form, there are no extra ingredients. I'm vegan and wondering if there are any animal or animal-derived ingredients in this product, e.g. gelatin? Thanks!